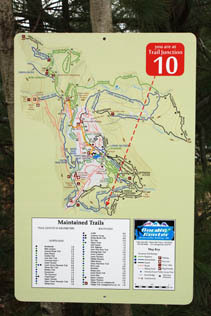 We print directly on 1/8" Sintra/Komatex to give you a trail sign like you see below. They are typically much less expensive than metal, and you can have them in a few days. 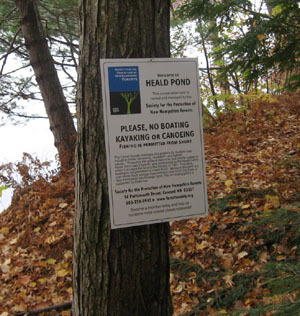 We can also print directly onto 1/4" Sintra/Komatex, which is tougher stuff, and onto painted aluminum sign blanks for the ultimate in durability. What's really cool is that you get full four color printing, and we can do it from your favorite graphic design program. You can do maps with "You Are Here" designations, photos, and logos. As avid hikers and cross country skiers, we've found it exceptionally helpful to have trail maps at important junctions in a trail system that let us know where we are! If you already have a board, like in a trail head kiosk, we can send you 13 oz vinyl banner material that you can install with a staple gun. 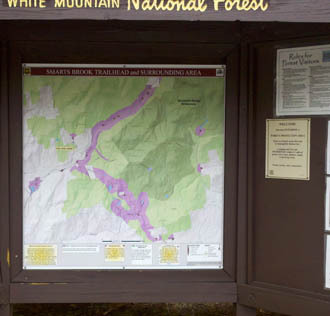 Our work is all over the White Mountains of New Hampshire, let us do some for you! We can print from all the common graphic design programs. Just send us your computer file. We support PowerPoint, which will give you very good results, all the Adobe programs, and can print a pdf from almost any program. Lead time is 3-5 working days. Call us for large quantity pricing and for special requirements. To order: Give us a call on 603-536-2900. Our online ordering system does not do trail signs.